After the demise of good guy/bad guy/god guy again/completely morally ambiguous male protagonist “Brody” at the end of season 3 there must have been a discussion about whether the show should continue. However for producers “Showtime” this was probably never an option as it is consistently acclaimed as the networks best show and has brought many awards to female lead Claire Danes. Even Obama is a fan. So with a main character gone and with him the relationship that formed the basis of the past three seasons it made sense for a change of scene. We find Carrie Mathieson (Claire Danes) as the station chief in Afghanistan but there is not enough action in Kabul so she worms her way into a transfer to Pakistan which will be the focus of the new season. She has now given birth to Brody’s child and seems rather regretful, you can sense the writers of the show share her regret at having the baby as what seemed like a good sentimental idea in the middle of season three is now just getting in the way. The scenes of Carrie and the baby really slow down the premier episode without adding much at all. The main cast of supporting characters returns with the addition of Corey Stoll (who you may recognise from season 1 of House of Cards) playing the mysterious station chief in Pakistan and Suraj Sharma (Life of Pi) as a vulnerable but intriguing looking medical student who happens to be a relation of a wanted terrorist. The show has been criticised in the past of being islamophobic and oversimplifying the situation in the Arab world while accepting the use of torture and the death of innocent civilians as collateral damage. The fourth season does however seem to be addressing the morality of these issues as well as the use of drone strikes and seems keen to point out that not everyone in the CIA is OK with killing civilians. A few army men questioning how blowing up a Pakistani wedding could really be for the greater good is not enough but it is a step in the right direction. The show as a whole remains captivating and while it certainly won’t be doing American-Middle East relations any favours it will probably earn Claire Danes another few shiny, gold trophies. 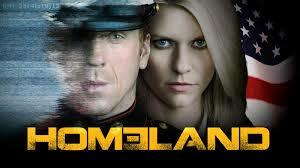 Posted in Arts and tagged homeland, review, TV. Bookmark the permalink.